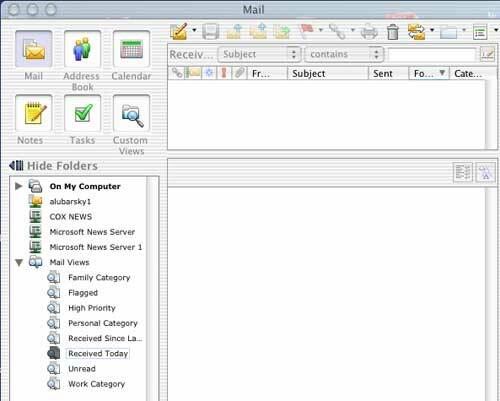 Mail is well integrated with Mac’s Address Book, which was also installed with Mac OS X 10.2. Should you decide to make use of the Address Book as a part of your personal information manager (PIM), using Mail simplifies matters. While it is rumored that Address Book will be updated as part of Apple’s overall digital “lifestyle” plan, it is now a rather lightweight but almost adequate PIM. Mail is also integrated with Apple’s dictionary and spell-check capability. Since it is a consumer-oriented program, Mail installs and sets up easily and allows the import of most existing email folders should you be updating from another Mac. (see Figure 1 - Import) and will handle most email accounts except AOL. Importing existing Address Book information from another application is slightly more complicated, but is possible -- without reentering data--with some effort. Mail has sufficient flexibility to be a least partially customized in appearance and it has the rather cute Apple “eagle on a postcard” icon that bounces nicely on your Dock to signify arrival of a new email. Also, you’ve already paid for it once, since you have Mac OS X 10.2 (some would invert that logic to say it’s free, but that begs the issue). Figure 1: Apple Mail offers a flexible and easy to use import button, for pulling old mail into Mail. One can’t mention email these days without a passing reference to its arch enemy- junk mail or spam. Mail has the currently popular type of mathematical filtering (Bayesian) to help reduce unwanted email and contains a selectable training mode to learn your criteria for junk. No filtering system is fool proof, however, and if you make it easy for the harvesters to glean your email address, not even the Rev. Bayes himself will keep the resultant offers out of your inbox. Of all the applications mentioned here, Apple’s filter is at least as good as the others and often better. Also, while there are several add-on commercial filter applications for Windows machines, there aren’t many effective ones (SpamFire, excepted) for Macs. There are several reasons that you might need to avoid using Apple Mail, the primary one being that one or more of your Macs can’t (or you decline to) run Mac OS X. There are also a few other cases where there may be better choices. Microsoft (MS) includes Entourage within the MS Mac Office X suite (i.e. with Word, Excel and PowerPoint) and also offers it for sale at about $90 as a stand-alone email application. Office X and Entourage also run only under Mac OS X. A less full-featured but similar emailer from Microsoft is Outlook Express (OE) that runs only under Mac OS 9.1 and earlier. (See below). For those that live (or think they are forced to live) in an MS Office environment because of employment, interoperability with Windows users or other needs, Entourage is very well integrated into all the other Office applications. It has features not included in some other emailers, such a full-featured Address Book, Calendar with notifications, Notes, Tasks and more. If reaching your corporate workplace email from home or elsewhere or being mainly dependent on MS Office is critical, Entourage will make life easier, although the other emailers can also cope with this situation, given some level of Mac expertise within your company’s IT department. All of the above assumes you (or someone else) already needed and paid for MS Office X and wound up with Entourage as a part of it. After pondering the alternatives for some time, I am unable to come up with a compelling reason for anyone to purchase Entourage as a stand-alone application, unless they have a vested interest in helping the MS profit statement. If this opinion turns out to be somewhat universal, the future of Entourage may be in doubt, especially as a stand-alone application. MS has already decided to drop future support for their browser, Internet Explorer (IE) for Mac, and the business case here appears to have some parallels. But then again, Entourage isn’t free like IE, and not all prospective purchasers read the Journal. Figure 2: Entourage is not only a decent mail program, but it has an integrated calendar, task manager, and notepad. Installing and setting up Entourage is simple using the Office X CD-ROM. Its folder filing system is intuitive and if pack ratting is your trait, a couple of thousand old emails can easily be filed away in as many folders and sub folders as you like and can easily be retrieved or refilled and otherwise manipulated. It handles attachments well, gives a choice of compression schemes and generally is well behaved. It makes use of Word’s dictionaries (including any special ones you’ve set up) and its spell checker. This allows your email to stay consistent with MS’s view of the English language. Not compelling from my prospective, but if you are someone with several thousand emails filed away in OE, moving them to Entourage is almost automatic. (As an aside, it is also easy to import them into Apple’s Mail.) Entourage’s stylized, glowing purple “e” icon also clashes with my sense of desktop aesthetics and the Dock color scheme. MS applications have gained a reputation as being poorly designed for privacy and security features and have often required frequent security updating. Entourage hasn’t had many updates so far, which may mean that MS has improved or that these incidents will be reported in the future. Eudora is the only more specialized email program I will comment upon, but rest assured there are many others, mostly with a fee. Just aim you browser toward email applications. There are three current Eudora applications available and they can all run on Mac OS 8.6 through the latest Mac OS X 10.2 (and most probably on Mac OS X 10.3 when it gets released). The available versions include Eudora Light, which adequately does basic email and is free. The version of more interest is Eudora 5.1, which is available without cost (notice that I avoid “free” here?) when supplied with pop up-ads (more kindly referred to as the “sponsored” version) and the same program without pop-up advertising that is available for $40 or $50 depending upon your previous ownership status. First and foremost, no true Mac nerd, geek or propellerhead-type expert (or wanna be expert) would ever consider using a built-in, manufacturer’s software if there is a more complex, precise or exacting set of code available. MS products aren’t mentioned in a polite way among these folks, either. This isn’t meant to disparage anyone. But to gain knowledge and expertise in these areas, it is best to start with a sharp and powerful tool; Eudora has usually been the first choice of those trying to learn how email really works rather than to just successfully download today’s jokes without incident. 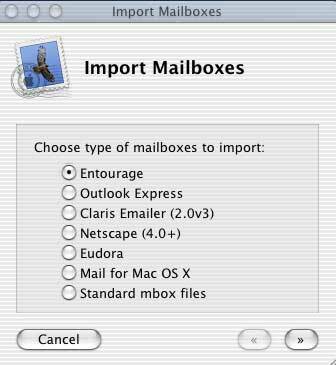 Eudora does the mail job really well, too, and its features are clearly and precisely explained and controllable, unlike Entourage and to some extent, Apple Mail. Those with sharp eyes have already noticed that it runs on all recent Macs and thus is an outstanding choice for those that would like the same email application on their older and newer Macs. And it is also cross platform, so that it will also look pretty much the same on a Windows machine should that be a consideration. It provides a Palm Conduit for those desiring to read email on a PalmOS PDAs or whatever. Eudora has been around since the early Mac days (1988) and is now produced by the cellular telephone giant, Qualcomm, so it, too, is a good bet to be supported for quite awhile longer. More importantly, after you learn all the things that are possible with Eudora 5.1, you’ll be a lot more qualified than me to author the next article on the subject and to post your suggestions on the “Internet Software” board of the WAP’s TCS. And of course, you’ll want to visit Eudora’s website to learn of Eudora Welty and the post office if you aren’t an English major who should already know the reason for its name. Netscape’s Navigator packages are combination applications that handle browsing, instant message/chat and email, somewhat like Swiss Army knives (the code would probably open an occasional sardine can, too). Version 6.1 is for Mac OS 9 and Version 7.1 for Mac OS X; they are similar in appearance. While there were some initial reports that version 6 was slightly buggy, it appears OK for at least occasional use and 7.1 works reliably. While using combination tools like these usually leaves a lot to be desired, many smaller ISPs seem to favor handing out Navigator to their subscribers since it is a free, single, cross platform (Mac, Windows, Unix, Linux) application that makes the training of their first-line help desk personnel somewhat simpler. As a Mac user, the primary reason to consider using Navigator 7.1 is its ability to deal with AOL. This is not that strange, since AOL owns Netscape. Thus, if someone near and dear to you (i.e. someone who shares your Mac or has another Mac or PC on your home LAN or WLAN) insists on using AOL as their ISP, Navigator has lots of advantages. 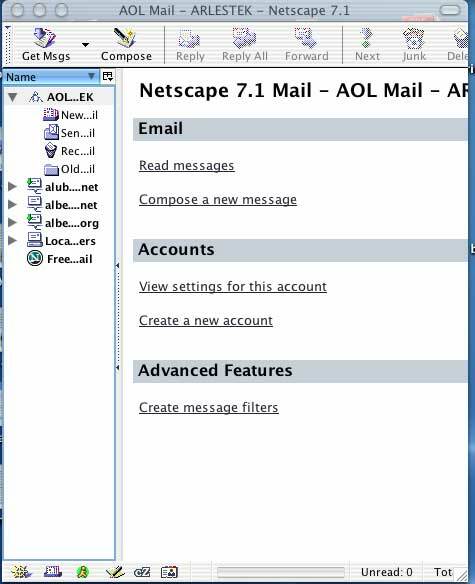 It integrates AOL mail folders in the same window with other mail accounts and actually allows two Macs with different screen names to be active on the same AOL account in order to download mail at the same time-- over a broadband (DSL/cable) connection. This is something that isn’t possible if both users try to log on with AOL directly. Strange policy! Figure 3: Netscape Navigator 7.1 combines a modern Web browser with a mail client that supports regular email, instant messaging, and AOL mail. OE runs under Mac OS 8.6 through 9.x, but not Mac OS X, and is free. It is reasonably full-featured as described under Entourage above and when initially released in the mid- ‘90s was arguably considered an improvement over any other free email program. However, since the release of Mac OS X and Entourage it has not been improved and in actuality has gone the way of IE, without the benefit of being announced as a casualty in an MS press release. It contains only rule-based filtering that was state of the art six years ago. But again, it is stable under older Mac OS’s and is free under any definition of that term, so if you need an emailer for an older Mac running under Mac OS8.6 or 9.x, that you won’t be upgrading, OE is still a reasonable choice with little down side, except that it is from MS and won’t get any better. Decisions about an emailer aren’t irreversible and there is no rule that you can’t try several either at the same time (with a little necessary discipline to keep up with multiple copies of your incoming mail) or serially. There is always good information on Washington Apple Pi’s TCS (usually under “Internet Software” category on the “Computing” board) and lots of other places. Also, don’t get too enamored with any of these programs since many applications --both great and poor-- have a habit of disappearing, fading away or being drastically changed for a wide variety of reasons. Good luck in using your old or new Mac to handle email and please leave me off your joke list! Al Lubarsky is an 8-year WAP member who has used all of the products described, in one version or another.